Written and directed by Argentinian Juan Solana, Upside Down is a truly awful movie, and I was disarmed at the end when it left itself open for a sequel, which we surely should be spared. It's set in a future where the Down Below earth has become a dystopian wasteland and an inverse twin planet Up Top is a sort of corporate version of utopia where TransWorld rules. I guess. Anyway, from an enchanted mountain crag downtrodden Adam espies beautiful Eden (yep, those are their names) across space. Adam enlists his fellow shop workers to fashion an unfathomably bulky contraption, the weight of which will allow him to fall to the other planet or be propelled there or something, and the soles of which will keep him stuck to the ground in defiance of the backwards Up Top gravity, but they keep heating up and burning his feet. Adam (Jim Sturgess) is very earnest and Eden (Kirsten Dunst) is very dull. The sense that Mr. Solana thinks that all of this is very meaningful is painfully, palpably obvious, and it just makes you embarrassed for everyone involved. I used not to go to these dystopian/invasion trope movies, but they -- along with zombie movies, which I do not go to -- seem so much a part of the zeitgeist that I've been going to some of them. (I spared myself World War Z, which covered all bases by mixing dystopian/invasion/zombie tropes together and throwing Brad Pitt into the mix for safe measure.) A.O. Scott puts Antoine Fuqua's Olympus Has Fallen into the "school of Die Hard" movies in which "a weary and battered law enforcement professional, severely constrained by time and space, fights off a ridiculous number of bad guys," in this case, an infinitely cloning battalion of Koreans who invade the White House and kidnap Aaron Eckhart as president. 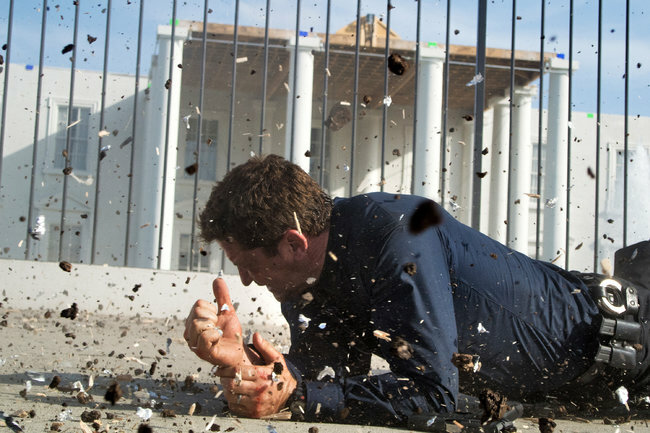 Gerard Butler is our hero. 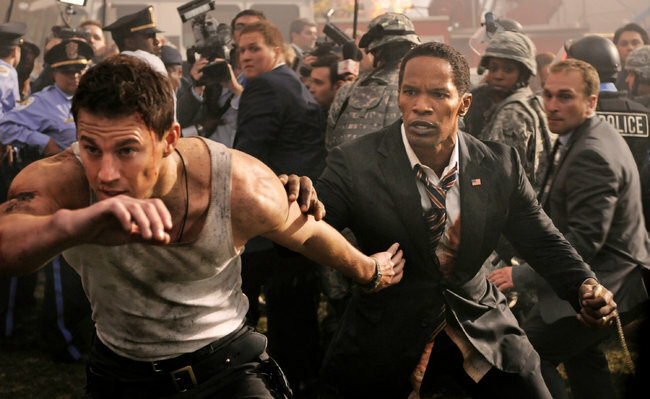 In White House Down, Roland Emmerich, he of Independence Day, tells essentially the same tale we just heard in Olympus Has Fallen, except this time our hero is Channing Tatum and the president is Jamie Foxx and gets a lot more screen time as he is ferreted through the White House by Mr. Channing while an infinitely cloning battalion of maniacal psychopaths led by James Woods pursues. Mr. Channing's hero has a daughter whose baton recital he feels guilty for having missed, so he takes her to tour the White House about which she has encyclopedic knowledge. And then... Wrapped up as the whole thing is in the stars and stripes, if we haven't "gotten it" by the end, daughter escapes but not before grabbing one of those ridiculously jumbo-sized flags and rushing out to wave it -- ala baton routine -- to warn the fighter pilots not to deploy nuclear bombs, thus saving the day and the president. Why do these movies endure? From whence does the paranoia stem? Part of it, I realize, is that these GCI behemoths are vehicles aimed at a testosterone driven adolescent male market, but that doesn't explain my audiences, which are dominated by decidedly middle aged men and women. The Hunger Games was a box office success, and The Dome, much of which I saw and found boring, was a successful summer TV phenomenon. Though we no longer live with the Cold War and the imminent threat of nuclear annihilation, I can see White House Down and Olympus Has Fallen as manifestations of our xenophobia and our fear of terrorism, but the fact that both plot lines hinge on an invasion of the White House and saving the president at a time when many Americans claim to distrust government seems schizophrenic. TV's strange new concept Hostages, where a rogue FBI agent threatens a doctor's family if she does not kill the president in her care, is another variation on the theme. This premise, like The Dome's, is implausible to begin with, but might be marginally OK in the course of 90-120 minutes, but to drag them out on TV in episode after episode is preposterous. It also seems disingenuous that our futuristic dystopias look very much the result of global warming. The origin Superman story this summer opens with Krypton's demise, the result of an unstable core caused by years of reckless depletion of its natural resources. So do these stories reflect a deep down unconscious admission that we DO need government and that climate change IS real, while being packaged in such a way (pseudo-patriotism, CGI eruptions, extraterrestrial habitats) that we can blithely ignore those facts? Just as Adam must invent a way to get to and stay Up Top in Upside Down, in Neill Blomkamp's far superior Elysium Matt Damon must be re-engineered so that he can get to a golf-course-designer utopian ship (which, as in Upside Down seems to be modeled after a multinational corporation) that 1 percenters have created so as not to have to worry their pretty heads about the riffraff below. Mr. Damon's character is named Max (hmmmm), out of prison and doing what he can not to go back -- again. He toils in a factory among the great unwashed making robots that service Elysium. Parts are irradiated, and when the door to a chamber jams, the foreman makes Max crawl in to release it. Max is trapped and exposed to a lethal dose, which sets the narrative in motion. At first it's just Max making a deal with drug smugglers to get to Elysium to save himself. But the daughter of a woman he meets also needs access to the medical equipment only available on the orbiting paradise or she will die. Max must save himself and the woman and her daughter -- and by extension, the world. 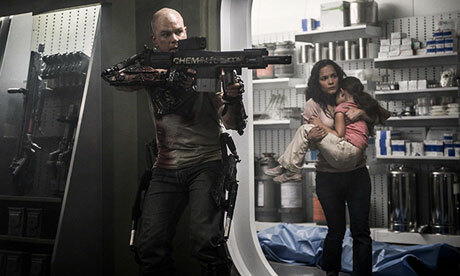 Blomkamp's first film was District 9, and Elysium shares its didactic political overtones. With District 9, however, Blomkamp had to work with a small budget, which made his directorial choices more creative. Though Elysium is a good looking movie, once Blomkamp got his hands on big Hollywood bucks, he went all CGI, which is unfortunate. Mikael Hafstrom's Escape Plan features a Guantanomo Bay on steroids, and seems to be making a bit of a political point about the dangers of outsourcing prisons to private contractors. Sylvester Stallone makes a living breaking out of maximum security facilities; in fact, he's written the definitive book on the subject. He somewhat hesitantly takes a gig that violates all of his protocols: having someone inside, his colleagues being in on his location, etc. 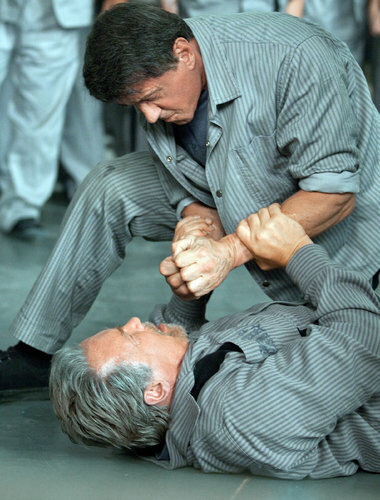 There he meets Arnold Schwarzenegger, and in exchange for Schwarzenegger's help, Stallone promises to get him out too. Now our dystopia is a vertically constructed, super high-tech penitentiary where each disappeared prisoner is kept in a transparent tubular cell -- cells upon cells as far as the eye can see. Their overlords initially appear to be robots. Nevertheless, in what seems to me an anachronism in so supposedly sophisticated an incarceration system -- yet one necessary to any kind of plot movement -- the men are let out of their cells for meals and recreation in big open areas. Not a good idea. Jim Caviezel (of Person of Interest who also played the traveler to whom the harrowing story is told in 2008's The Stoning of Soraya M.) does a fairly nice turn as the sadistic prison warden.